BUCHAREST (Romania), October 10 (SeeNews) – Unemployment and corruption remain pressing issues for the countries in Southeast Europe (SEE) despite an upturn in their economic performance, the Regional Cooperation Council (RCC), an organisation fostering partnership in the Balkans and their Euro-Atlantic integration, said. Unemployment continues to be a major concern, while the perception of traditional democratic institutions, for reasons both complex and manifold, leaves much to be desired in terms of both performance and public confidence, RCC said on Monday upon the release of the Balkan Barometer 2017 survey. In response to the survey's question, "How many people in your family who are able to work are unemployed? ", 29% of all interviewees said one person, 16% said two people, while 8% said 3 or more people. The barometer also highlights a growing anxiety over corruption, as 32% of the interviewees rated corruption as one of the key problems for the region in 2017, compared to 27% in 2016 and to 15% in 2015. "An upturn in economic performance by the region’s economies has brought about an increasingly optimistic outlook for the future that needs to be solidified through decisive government action," RCC secretary general, Goran Svilanovic, said. Despite notional support for European integration there continues to be widespread scepticism about the region’s short to medium term accession prospects, with 23% of respondents saying they believe EU membership will never happen, the barometer also showed. Slovenia joined the EU in 2004, Bulgaria and Romania followed in 2007 and Croatia entered the bloc in 2013. Serbia and Montenegro have opened accession talks and Macedonia has been granted candidate status. The survey also found that business people continue to struggle with what they see as complex taxation and an unfriendly business environment with an unpredictable legal system, Vladimir Gligorov, GfK’s expert consultant for the barometer and researcher at the Vienna Institute for International Economic Studies, said. Some 62% of business people in the region perceive it very hard or hard to start a private business in their place of living, while more than half of them believe that upgrading roads would have the most positive effect on their business. "While 56% of respondents agree that the government takes note of their needs, but only to a limited extent, it is positive to record the decline in the number of respondents who feel ignored by the authorities - down to 30% from 38% in 2015,” Gligorov said. 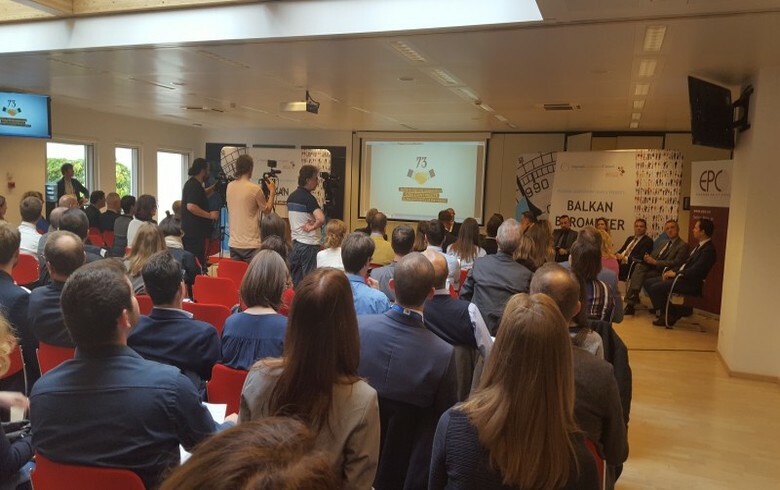 The Balkan Barometer is one of the annual monitoring tools used to track progress in the implementation of RCC’s SEE 2020 Strategy when it comes to growth, employment and competitiveness in the region. Published for the first time in 2015, it surveys 8,000 citizens and 1,600 businesses in Albania, Bosnia and Herzegovina, Croatia, Kosovo, Montenegro, Serbia and Macedonia, on a wide range of issues dealing with the political, socio-economic, business and investment climate, infrastructure, rule of law and other developments in the region.